The grief associated with such reproductive losses is often minimized, denied, and considered to be outside the normal "grieving rules" of society. Yet individuals who have suffered these losses can experience profound grief and emotional pain. Their grief needs to be acknowledged by themselves and by others. Grieving Reproductive Loss: The Healing Process acknowledges the devastating impact these losses can have. Written in "plain language," the book attempts to bring about a greater understanding of the grief associated with reproductive loss and, through the Healing Process Model(c), offers a holistic approach for constructive healthy grieving and healing of body, mind, and spirit. The Healing Process Model©is especially helpful for individuals who have suffered a reproductive loss because it is derived from their experiences of loss and grief and differs from some existing models of grief developed in studies of widows and widowers. Bereaved parents present a special challenge due to the uniqueness of parental grief: they have experienced not only a reproductive loss and the tragic death of a child, but also the loss of part of themselves, the loss of a future life with that child, and the loss of hopes and dreams. The guidelines of the Healing Process Model© can be used for recognizing, acknowledging, and intervening in reproductive loss by the bereaved themselves, by friends and family of the bereaved, and by health care providers, whether or not trained in grief care. The book includes chapters on grief; the body, mind, spirit connection; relating Worden's Tasks of Mourning to reproductive loss; facilitating the healing process; obstacles to grieving; issues related to reproductive loss; types of reproductive loss; reproductive loss as a family affair; establishing support groups; and caring for oneself while caring for the bereaved. "As a member of the perinatal bereavement team at St. Mary's Hospital Centre, I am only too aware of how misunderstood is the grief involved in reproductive loss. 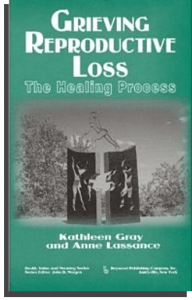 The good news is that Montrealers Kathleen Gray and Anne Lassance have written a very comprehensive, sensitive book that can help families deal with this difficult issue. Grieving Reproductive Loss is 196 pages of excellent information for friends and families of the bereaved as well as for healthcare practitioners. I would strongly recommend this book to all health-care practitioners who work with clients affected by reproductive loss. I would also recommend it to anyone who is interested in understanding this topic further or the concept of grief in general." "This book speaks powerfully of the suffering long known by adults seeking the world of the parent, but often ignored, minimized or discarded by the world and the professionals who provide care. This book will serve well." "I found this book quite enlightening and clearly represents considerable advance concerning bereavement in the aftermath of reproductive loss. The authors are to be lauded for their efforts to fill a void in the literature by not only articulating issues related to reproductive loss but also outlining a healing process model specific to the unique grief experience following reproductive loss."